2005 Cincinnati Magnum HPC-1000XT Equipped with 3 Large 40" Pallets. Machine has Full 4th axis and coolant through the spindle. Multi Pallet Machining center with through the Spindle coolant and rigid tapping. Currently under power machining engine blocks. This DAEWOO Doosan ACE HP 5500 Horizontal Machining Center from 2006 was made in Korea and has a working history of 51000 production hours. Operated through a FANUC 18i-MB Control unit, this versatile and precise machine has mainly worked with bronze and cast iron during the past. This DECKEL MAHO DMC55H duoBLOCK Horizontal Machining Center was built in 2008 in Germany and has been working for 33471 hours. Equipped with a SIEMENS 840 D Control unit, this reliable machine incorporates 2 pallets (400x400 mm) and a Reinshaw probe among other equipment. 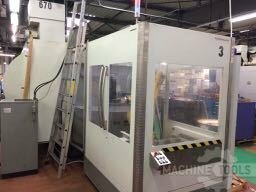 Dorries Scharmann Solon 4 heavy 5 axis twin pallet CNC machining center. The machine has a CNC B axis 360 degrees. Machine has been taken off power. Available immediately. Subject to prior sale. This machine is in good condition ,if you are interested ,please contact to us .